There were no shortage of Doctors to make sure 'their' Whomobile was being correctly looked after! smallspace awards the Best in the Solar System trophy (above) for the best display or individual model. Meanwhile Davros and the Daleks go on their usual rampage. Above: more storyboards, and the shuttles from The Invisible Enemy. The 'head' is Sutek from The Pyramids of Mars, another Ian designed. Above left: UNIT soldier stand guard by Chris Hughes UNIT Land Rover. Above: The amazing wood creations of Antares Concepts. Left: ASA - All Sections Alpha - with some of their creations. Right: and ASA members also bought along some of the original puppets from Gerry Anderson series. Spot Joe 90! Left and right: last year's Best in Solar System winner, David Sisson, (left, left), with some of his creations. With him (left, right) is Simon Rhodes - with a cup of tea! Above: general views from inside the specially erected marquee (top left), and the Main Hall (top right). Meanwhile Evan - above - takes it all in. Right: Harrison Hinton (right, left), with dad Chris , and some of his collection of Spittin' Image puppet heads. Above Tony James of Timeless Hobbies, perhaps still better known as Comet Miniatures? Left-right: Some go to great lengths to impress their customers, such as Davy Limburg of Sante Claus. Left: James Burgess and Helena Enright-King with their costumes. These include a pink cyberman??? Or should that be cyberlady as we think Helena is inside? Above left: Mamas Pitsillis of Studio 2 Models and his giant Skydiver and (centre) his working SHADOmobile. Above right: Sophie Monks on the Tirydium Models stand. Her dad, Warren, is in the Stormtrooper costume - we think, unless it's an actual Stormtrooper? 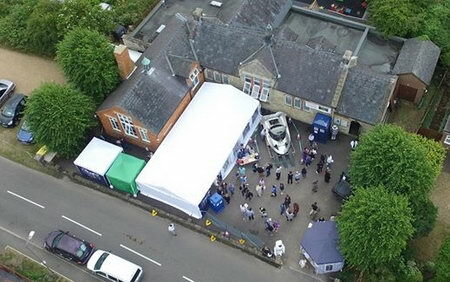 Right: either the Tardis is getting smaller or The Doctor (here disguised at Richard Ashton) is getting larger? 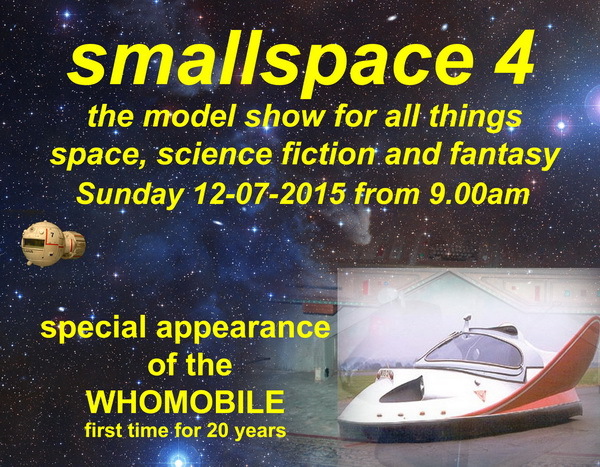 OK how did the Whomobile get to smallspace?